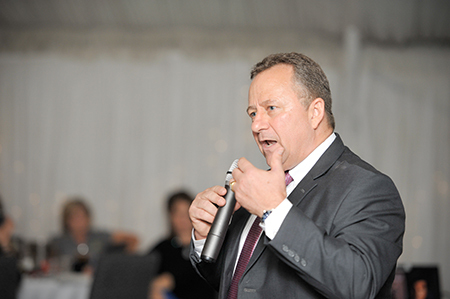 Predominately engaged as a large scale conference speaker, sales trainer, event MC and presentation evaluator, Rob has been involved with over 600 clients and over 2100 organisational events to bolster employee results and company objectives. 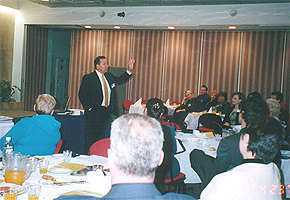 During the entrepreneurial 1980's, Rob was instrumental in driving new revenue and sourcing new clients to rebuild one of four United States based Tom Hopkins International (THI) Sales Training Centres and companies in the emerging technology rich cities of Seattle & Bellevue based in Washington state. Within a year, Rob was asked to expand the west coast USA division of Tom Hopkins Marketing and Seminar operations in Orange County / Irvine, California. The skills of recruiting, hiring, training and motivation as taught by Mr. Hopkins were instrumental in Rob developing the most productive tele sales and field team trainers and presenters in company history. As a result, tens of thousands of people attended seminars taught by Mr. Hopkins in Irvine, Anaheim, Los Angeles, Burbank, Riverside, San Diego, San Jose, San Francisco, Portland, Seattle and the capital city of California in Sacramento. These results led to a promotion and relocation to the Scottsdale, Arizona head office to further develop the most successful Tom Hopkins seminars as measured by attendance and product sales offerings across 18 USA States and 3 Canadian provinces. In his first year of qualification, Rob was inducted into Tom Hopkins Presidents Achievement Club. As Vice President of Marketing and Sales, his responsibilities included tele sales / field team recruitement & development, regional and national account growth strategy, regional training and speaking at client events while exceeding personal production and team revenue targets. With the 1993 international news of the 2000 Olympic Games awarded to Sydney Australia, Rob was asked to bolster sales and service operations for Tom Hopkins training and seminar operations based in Sydney. Rob's strategic and leadership role with Sales Pursuit Pty Ltd ensured sold out events with tens of thousands of delegates attending Tom Hopkins events held in Brisbane, Sydney, Melbourne, Adelaide, Perth, Auckland, Singapore and Manila. From 1994 to 2000, Rob was a driving force in leading dozens of marketing agents and national / regional sales teams who filled conferences and large scale events for Tom Hopkins South Pacific and SE Asia conferences. In addition, Rob's agents and sales teams sold out national events for speakers and leading authors such as Jim Rohn CPAE, Anthony Robbins, Brian Tracy CPAE, Zig Ziglar CPAE, Dr Deepak Chopra, Dr Robert Bays, Jay Abraham, Brendon Bays, George Walther CSP CPAE, Dr Stephen Covey CPAE, Robert Kiyosaki, Tim Shaw, Dr Marianne Williamson, Dr Denis Waitley, Dr Deborah Waitley, Chin Ning Chu, Wayne Dyer, Dr John Grey, Wayne Berry CSP, Doug Malouf CSP and 4 star General 'Stormin Norman' Schwarzkopf. Having personally sold millions of dollars of professional development products and conferences, Rob's specialty skill in recruiting, hiring, training, motivating and retaining seminar teams has been replicated in the US, South Pacific and SE Asia markets. TH, RSM, SP & SRI sales teams under Rob's leadership have produced tens of millions in revenue for these speakers and authors through live programs, in-house programs, professional development events, books, audio learning programs, c.d., DVD and on line learning programs. His numerous articles and case studies have featured in Quorum Magazine, Corporate Trends Australia, the Australian Financial Review, Work From Home Magazine, Professional Marketing, Business and Trends, St. George Business Review , Sydney Business Review,Sydney Convention and Visitors Bureau" e-news, MICE Asia, The Singapore Straits Times, Human Resources Today Asia), Walk Your Talk Magazine, Contact Singapore and Executive PA Magazine. Following the 2000 Olympic Games hosted in Australia, Rob was elected by NSAA members as 2001 to 2002 President of the National Speakers Association Chapter in Sydney and second term for 2002-2003. In addition to this role and in driving the creation and development of the NSAA National Speakers Academy and NSAA Spring Skills Programs, Rob was a Director on the NSAA National Board 1999 to 2003. He continues as an advisor and mentor to NSAA Executive Team Members and financial NSAA members to present day. He has frequently served the NSA Australia, NSA New Zealand and Asia Professional Speakers Association as an instructor for specialty topic courses, as an MC / Host at various chapter events or keynote speaker / breakout session trainer or MC/Host at National Conventions and Regional Conferences. Applying business concepts and systems learnt in corporate and private venture experiences, Rob developed a 14 member volunteer executive team and chapter KPI / service plan to re build the Sydney Chapter to a chapter of value to financial members. Executive team results included a 38% annualised new member's growth rate in 2001 and a 34% annualised new member's growth rate in 2002 to nearly 300 financial members at year end. Combining educational competency learning programs and clear communication to members, alliance partners, vendors and high end sponsors, NSW NSAA Chapter member retention rose from 52 % in 2000 to 81% year end 2002. NSW and ACT Chapter revenue rose by over 400 % from 1999 to 2003 with member account savings of five figures in bank at annual AGM audit. With succession planning built into his 2003 plan, Rob transitioned to a mentor and advisor role while the Sydney NSW Chapter continued as a premium professional speaker's chapter and model to other associations and non profit organisations. Rob continued supporting / mentoring NSAA as creator of the NSAA Added Value Sessions with it's on going implementation to present day. These mini workshops taught over an hour time frame in advance of NSAA regular chapter meetings are free for NSAA financial members and sponsors with a nominal fee to non members. All proceeds from these events are to defray operational costs associated to the National Speakers Association of Australia and have continued since being introduced in 2001. Created in 1995, this service award pays tribute to Mr. Walter Dickman, whom many consider the founding father of the Australian speaking industry. Mr. Dickman started his speaking and training career in the 1950's and helped pioneer the speaking and training industry over a 50 year time span. He built immeasurable goodwill throughout hundreds of communities and millions of people who heard of his inspiring stories and messages. Mr. Dickman (*) was still making an impact as a goodwill ambassador, mentor and professional friend well into his mid 80's. The Walter Dickman award is given annually to an individual considered by NSA of A peers who has given service beyond that expected of them in promoting, assisting and developing NSAA. Recipients are deemed by peers to have built a better community through professionalism, service, commerce and spirit. (*) On 11 October 2009 Mr. Dickman peacefully passed away - Walter was 91 years young. Rob qualified for this designation between 1997 and 2002. The formal CSP proceeding for the photo session was recognised at the Melbourne Australia National Speakers Association Convention in March 2004. Engaged by at least 75 different clients (minimum). NSAA Member two years prior to submission of application. Testimonials of work performed from at least 20 of the 250 engagements. Passed NSAA business compliance and education requirements. Attendance at six Chapter functions and two National Conventions. Given December 2004 for contributions to the NSW NSAA Chapter for driving educational learning programs, mentoring fellow members and in guidance to the Sydney based NSW NSAA Executive Leadership Committee. A national honour from Business SWAP International, Rob was given the coveted Directors Award by National President and Board Director, Ms Lee Clark. This award has been given to five people since SWAP Australia & New Zealand began in the late 1970's. The award acknowledges contributions and service to Business Swap over many years by individuals who are not members of SWAP, however have served members, guests and the organisation by promoting the values, ethics and SWAP business clubs to Australian and New Zealand communities. An active member of the International Federation of Professional Speakers since 1997, Rob continues to mentor new speakers and emerging experts in the speaking and training industry. Rob supports the industry each year and spoken at countless IFPS and GSF chapter events and conferences across Australia, New Zealand, the USA and SE Asia. April 2004: Ann Andrews CSP - NSA NZ National President and Julie Samson ASM invite Rob to speak at the Auckland, Wellington and Christ Church Chapters to present the First Speakers Academy Programs offered in New Zealand with dozens of members and guests attending. June 2004: Scott Friedman CSP & 2004 USA National Speakers Association President asks Rob to be South Pacific liaison & advisor to the Executive Board of the Asia Professional Speakers Association in Singapore and to help with the first Global Speakers Summit in Singapore for March / April 2005. Working closely with Scott, Angeline Teo, Margaret Loh, Benjamin Cheng and the Singapore Executive Team, the inaugural Global Speakers Summit and conference was held from 31 March - 3 April 2005. Nearly 300 delegates attended from the United States, Canada, Europe, South Africa, Australia, New Zealand, China, Malaysia, Thailand and the UAE. Rob's key role was in strategic planning, marketing and country liaison to help 70 delegates attend from Australia and New Zealand in addition to being a conference MC, Host and Speaker at Global Speakers Summit concurrent sessions. Testimonial for supporting NSA of Australia and presenting at NSAA Professional Speakers Academy from 2005 President Rodney Marks CSP. 2006 and 2007 Senior ddvisor to NSAA & APSS Executive Board. MC and Host for the Asia Professional Speakers Singapore Conference 17 & 18 May 2007 at Singapore Grand Copthorne Hotel. 2008: Senior advisor to NSW NSAA & APSS Executive Board. Key note speaker for the 2008 Conference held on 3 & 4 April at the Carlton Crest Hotel Singapore. With congratulations from 2008 Conference Chair David Lim and incoming President Christian Chua, Rob was re booked as conference Host / MC for the APSS National Conference held in May 2009 at the Furama Riverfront Hotel Singapore. 2009: Senior Advisor to NSW NSAA & APSS Executive Board. MC & Host at the APSS National Conference 8 May 2009 - Furama River Front Hotel Singapore. Rob continued support in mentoring of APSS members as creator of the APSS pre chapter meeting 'Added Value Sessions'. These mini workshops taught over a one hour time frame in advance of APSS regular chapter meetings were free for APSS financial members and a nominal fee to non members or the general public. As inaugural presenter February 2009, Rob's topic was designed to help members and guests increase their competency and skills as MC's and conference / event hosts. Rebooked October 2009 to teach members and guests how to gain more business from attending trade shows and international expositions. All proceeds from both events were donated to the Asia Professional Speakers Association in Singapore. Rob and fellow APSS member Tina Alteri chosen to co host and emcee the first APSS Charity event at the Singapore Institute of Management Campus on 1 March 2010. This event raised over $40,000 for the Singapore Cancer Society. Creator & Event Advisor: CSP Roundtable Event June 2010 at NSA of Australia Sydney chapter. 2011 Executive Member / Advisor to APSS Executive Board. Rob was the coordinator, MC & Host of the 30th June Singapore engagement that featured USA Sales Legend Tom Hopkins at the Sheraton Hotel for the Asia Professional Speakers Singapore chapter meeting. Featured CSP Roundtable CSP Speaker in Sydney NSAA September. Featured CSP Roundtable Speaker in Singapore - June. 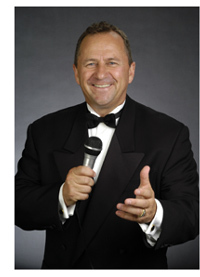 Featured MC & Host for Sydney NSAA Members Meeting - 16 April. Featured CSP Roundtable Speaker in Sydney - October / November. One of the reasons Rob has been booked and re booked by over 600 different organisations and over 2100 times as a speaker, trainer, event host or MC is our SRI client pledge agreement and guarantee. To find out more about this client pledge and guarantee, ask us during your briefing enquiry. What can YOU expect to gain by working with Strategic Resources International? SRI P/L and our alliance partners understand how important it is to GROW and RETAIN internal customers while expanding core services to new customers through innovative growth opportunities. To learn why we are re booked for company sales conferences, training events, hosting or as MC's for large functions, consulting and strategic marketing projects visit our "What People Say" section of this website. For information about how Rob Salisbury can enhance your next event or conference call your favourite Speakers Bureau for further information. Alternatively, contact SRI Sydney at +61 412 414 835 or e-mail rob@strategicresources.com.au or contact SRI Singapore at +65 9017 1825.